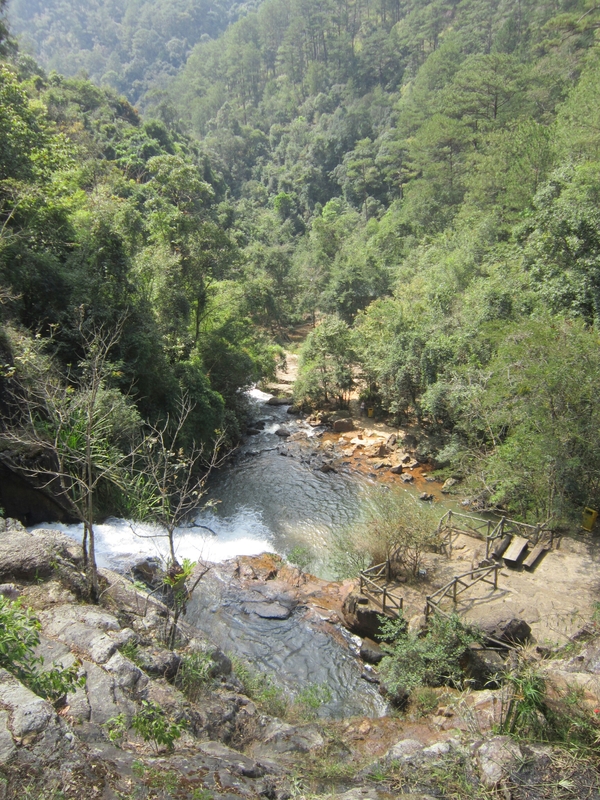 First thing – if you visit Da Lat I highly recommend you stay at Cozy Nook hostel! 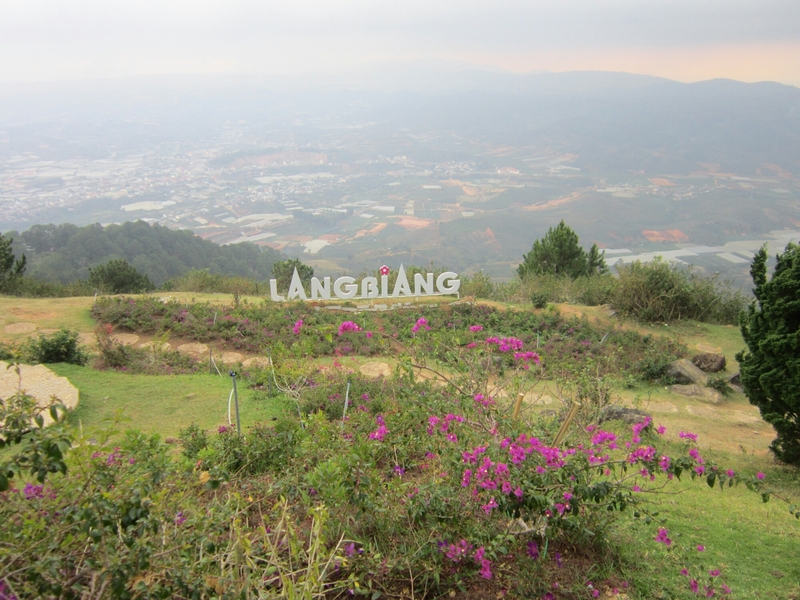 It’s a really great family run place and it really made my stay in Da Lat special! The owners are very friendly and helpful and every night they do a sit down dinner (only $3) for everyone in the common area, which makes it a very pleasant social hostel! Plus the food is fantastic and when I told them I was Chay (that’s Vietnamese for Vegetarian) they made me tofu whenever I couldn’t eat one of the dishes! Drinks are cheap (all 10,000 VND, including beer!) and you can sort all the usual hostel standards like buses etc easy, no hassle. So Da Lat is one of those places where it’s the activities and the people that made it special for me, rather than the city itself which to be honest I didn’t find that nice, in that the street layout is confusing and there are a lot of cars and scooters, making it pretty busy. People wise there were so many awesome folk at Cozy Nook, including Hanne, Harmke and Emma who’d also been at Under The Coconut Tree in Hoi An, and Sunny the crazy (in a good way) South Korean girl and her Norwegian pals Christian and Amile! I met Dylan and Amanda (England – Liverpool….they are Everton fans before you ask, Dylan is also half Dutch) there who I have now been travelling with since! First day me and Charlie who’d i’d met in Hoi An went to visit the Crazy House. It’s a weird place…still under construction in parts. You can actually stay there for the rather expensive fee of $35 if you fancy people constantly outside your room trying to look in. 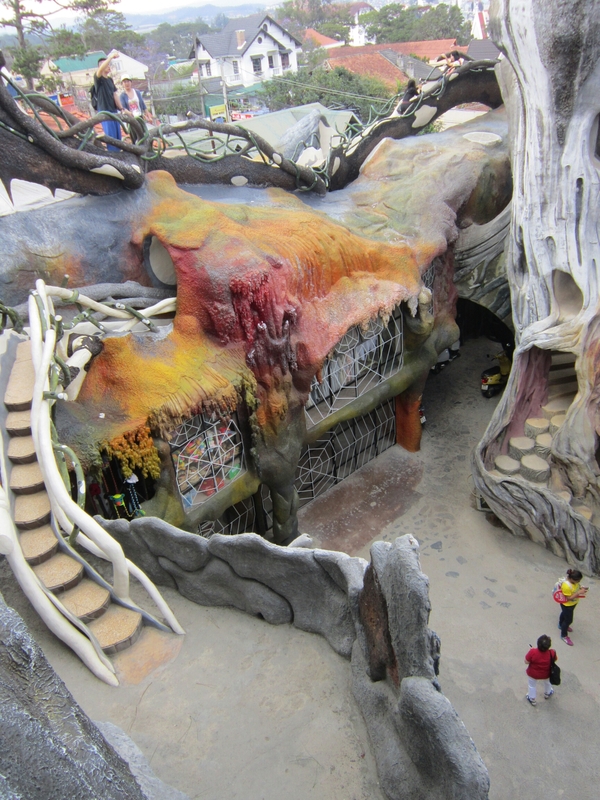 Should you go and visit the crazy house? Yes. Do I understand it? I am unsure. Will you enjoy it? Well sometimes bafflement is enjoyment. Day 2 me, Charlie, Dylan and Amanda rented scooters. I went on the back of Charlies, still stubbornly not driving! 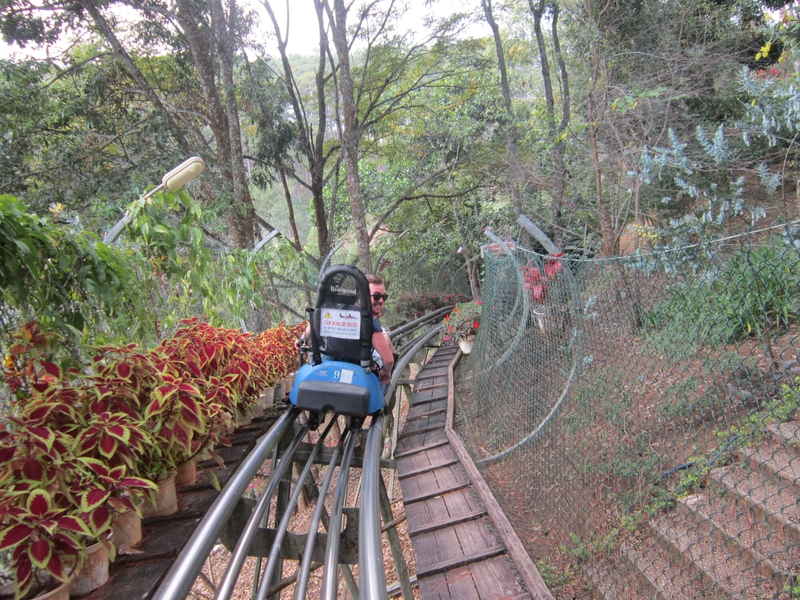 First up we went to Datanla waterfall, where we went on a rollercoaster ride where you control your cart yourself! It was insanely fun! Then we walked around the site a bit, the waterfall is very pretty. After that we drove to Langbiang mountain and walked up to the top, going through some forest on the way, great to be out in some nature. On the way back down the sky opened and it rained really hard, we all got drenched walking and then riding back!! It was some of the most intense rain I have ever had the misfortune to be caught in. One of the best things to do in Da Lat city itself is to visit the House Of A Hundred Roofs cafe/bar. When I say bar it’s more of a dark twisted maze with alcohol….!! We played the backpacker standard game there of hide and seek with a bottle of rum! Find the person with the rum and you get a shot! Much harder then it sounds, there are a lot of pitch black nooks and crannies in that place! Of course at the top of the maze where there is a seating area there were also people just handing me glasses of rum so inebriation came on strong! 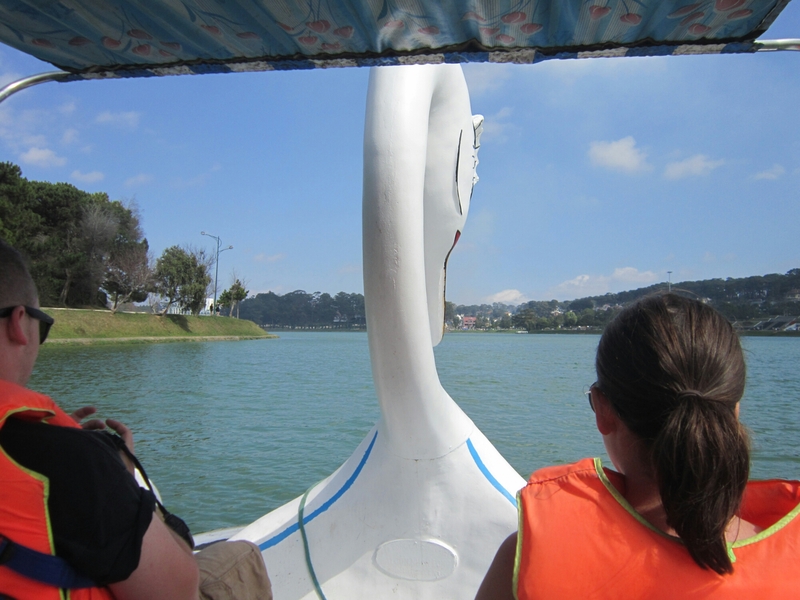 Feeling very hungover the next day, the most me, Dylan, Amanda and Andrew could handle was to hire a swan lake and paddle around for awhile on Da Lat’s very pleasant man made lake. Me, Dylan, Amanda and Andrew headed to Mui Ne from Da Lat, where we stayed on Backpacker Village, where the main feature is it’s rather enjoyable pool! Oh and there’s a Mexican restaurant next door which we took full advantage of! Mui Ne is essentially one long road along the coastline, very tourist orientated, especially catering for Russians as many of the restaurants and shops have everything in Russian as well as English (and a few places just Vietnamese and Russian). 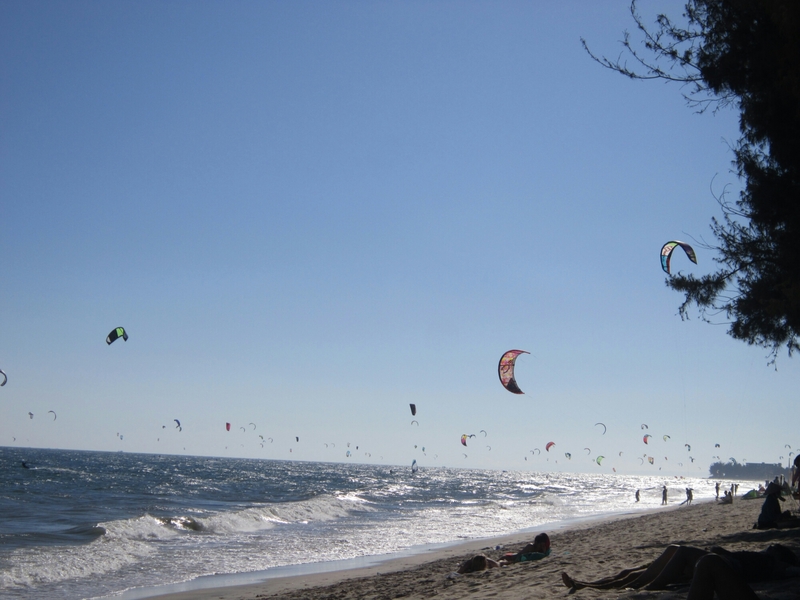 Mui Ne beach is kite surfer paradise, there are so many people doing it, very impressive spectacle! 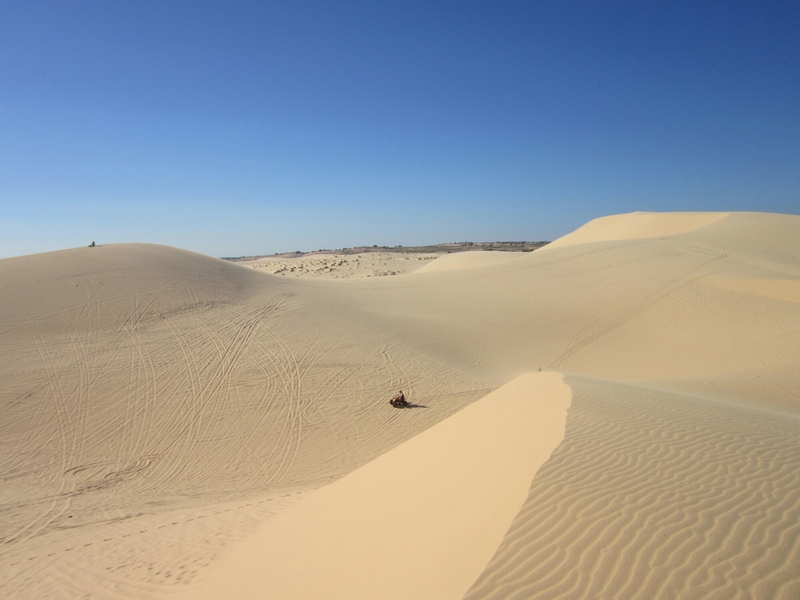 We spent a day doing the dune tour, which for $5 I thought was a good price. The start is the Fairy Stream, which is a kind of bizarre lengthy shallow stream running along past some cool rock formations. You do feel like Tuscan raiders may pop up at any minute…. 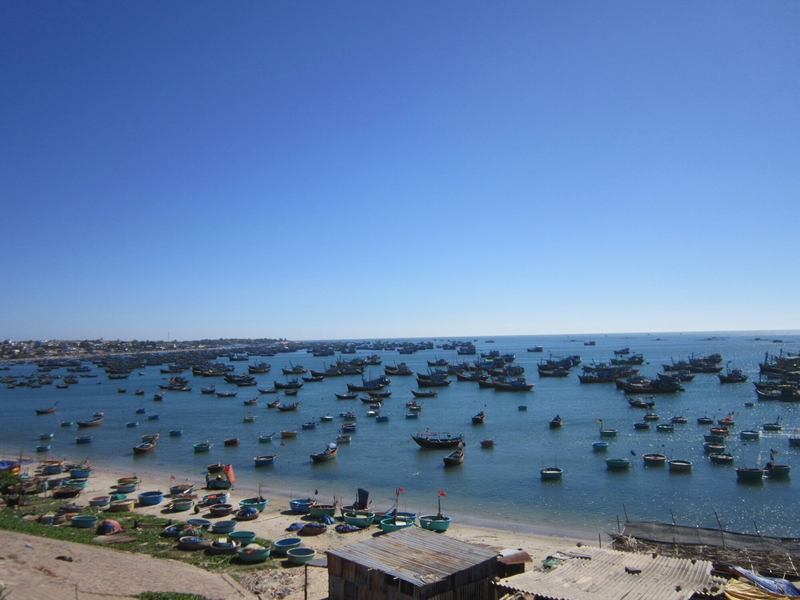 Next up was a fishing village, which was impressive to look at but i’m sure environmentally terrible. Then the white dunes, which honestly feel like the desert! 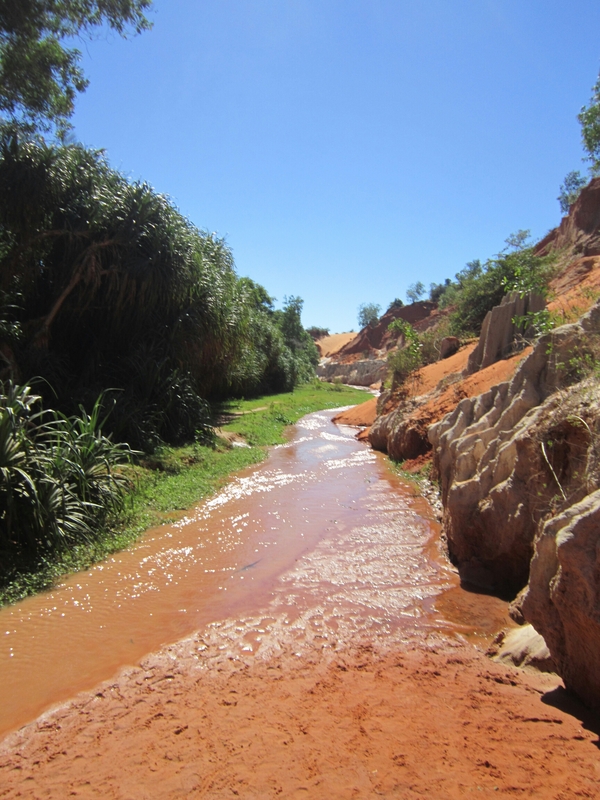 Bizarre to find these in Vietnam, felt like we were in the Sahara or something! A lot of people were paying stupid money to rent quad bikes but we just walked up the dunes and then ran down them, it was great! 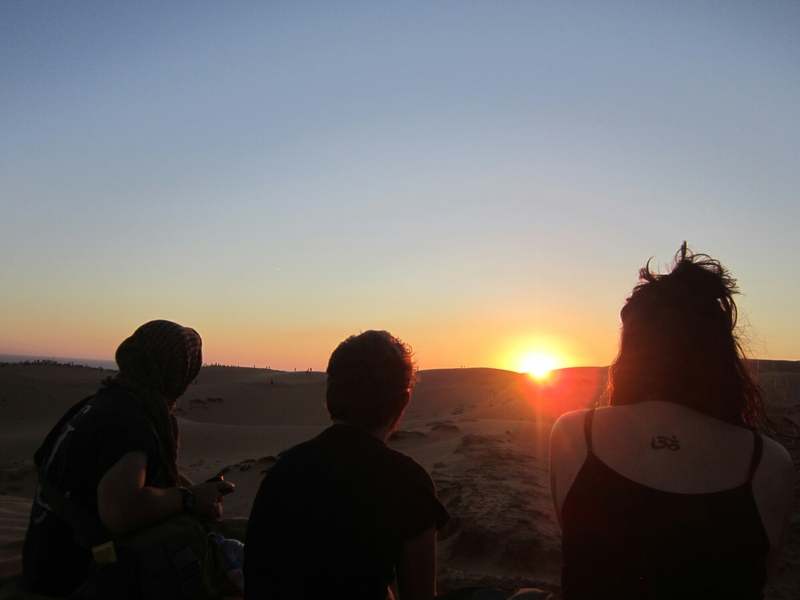 Last up the red dunes for sunset! Avoiding the kids renting out makeshift boards to ‘sand surf’ we determined that an alternative fun activity for us would be run up to the edge of dunes and hurl ourselves over, rolling down. It was awesome! The sunset was pretty sweet too! I must conclude that my time in Da Lat and Mui Ne was really fun and an excellent example of just how diverse a country Vietnam is!